This week we are on the letter "D" for the ABC Wednesday Meme. I'm so glad I started regularly participating in this meme, because it is fun, and I look forward to the challenge each week. I took the below photo in my office at work. I won the jar, which was full of regular M&Ms, at the work Christmas party, because I guessed the closest to the number of M&Ms in the jar. So, my office partner and I decided to keep the jar in the office and take turns filling it with goodies for whomever comes in our office. We haven't had to fill it very often though, because other people in the department keep buying goodies for us to put in the jar. Basically, they come in the office specifically to get some of the goodies, then they make some comment about there needing to be locking clamps on the jar to stop them from eating so much of it. hehe Then they end up going and buying us stuff to replace it with. So, that worked out pretty well. Don't ya think? I won the stuffed Snoopy Dog at a seminar I attended at work. I gave it to my office partner to take home to her kids, but she decided it would make a good mascot for our office. The other day, I filled the jar with some peanut M&Ms that one of our co-workers had bought. 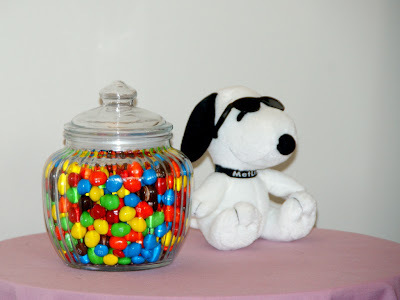 Then both my office partner and I commented at the same time that it looked neat with all the colored M&Ms in the jar and Snoopy Dog there to guard them. So, I, of course, photographed it. Oh my gosh Misty! This totally made me smile! I loved it! Creative and fun as can be! And now I have Linus & Lucy, that song from A Charlie Brown Christmas, stuck in my head! What is your favourite colour? I love green sweets! lol! Very colorful! Thanks for participating. Nothing like having Snoopy being the guard dog over the M&M's. I wonder if I set a candy dish on my desk if my hubs would fill it up? lol Love your guard dog too!